I am a recent Class A motor home owner and am having a problem with my service brakes, any recommendations would be appreciated. On my current trip, descending a small mountain at low speed in the lowest setting on the automatic transmission,the brakes overheated. The descent was at about 20 mph, for about 2 miles. I used the brakes very little and applied them hard and got off when using them. This is the 3rd time that the pedal fadded completely away when attempt to stop at the bottom of the hill. I have had several truck type shops look at the brakes and they tell me they are ok.
After cooling, the brakes work normally(?). I have always felt the pedal seems softer then it should. I am going to check on having the fluid changed. Any suggestions or comments on your P32 chassis brakes operation? I was going to suggest a brake fluid change, but you already mentioned it. Seems you are doing things right, but the if the fluid is old and broken down, it will overheat easily and cause the symptoms you describe. Hope you follow up and let us know if the change helped. If you have a heavier coach that may contribute to the problem. I would definitely be sure your brake fluid is good. Even slight moisture will allow problems when heated up. Your technique to apply the brakes firmly, then back off to allow them to cool a bit is way better than constant dragging. DOT 2	190 °C (374 °F)	140 °C (284 °F)	? My understanding is that DOT 5 isn't necessary, nor should be used in passenger vehicles. I forget the reason why. I use it in my race car but that is changed at least once a year(more often due to 'issues'} and doesn't see the continual use that a passenger vehicle does. Definitely more heavy duty but a green-white-checkered race lasts 10 minutes. DOT 4 should be all that is needed. The DOT 5 is silicone based and does not play well with the others. You can use it but you must flush the system well and then stay with DOT 5 only. All the others are compatible so if you replace with DOT 4 it doesn't matter as much if you don't get a good complete flush. 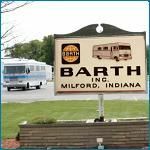 I'm glad that a topic like this is relevant to the Barth motorhome on the same GM P32 Chassis. The P32 Chassis was used on many motorhomes and learning that going to a DOT 5 isn't recommended is valuable knowledge. In a few days I'll move this post to MAHEM where it can be retrieved if we're doing a search. I'm proud of our members who are willing to help the SOB (Some Other Brand) members out and by osmosis you're teaching us too.